In the past weeks we have focused on the development of an international MssStick version. This was due to the increasing number of international requests for MssSticks. 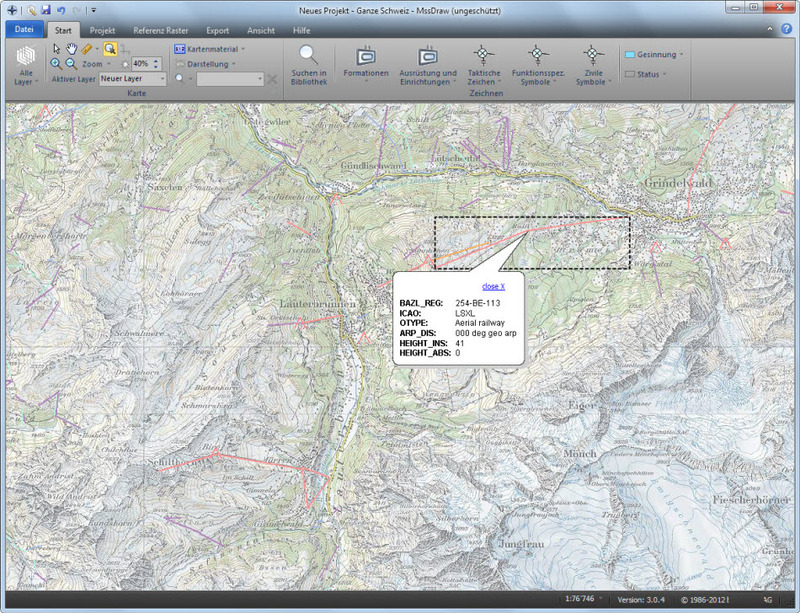 The international version of MssDraw uses the map services of Bing Map and open Street View. This version of MssDraw and MssComposer is using the international MssLibrary, which covers all the tactical graphics and symbols defined in the standards MIL-STD-2525C and APP-6B. 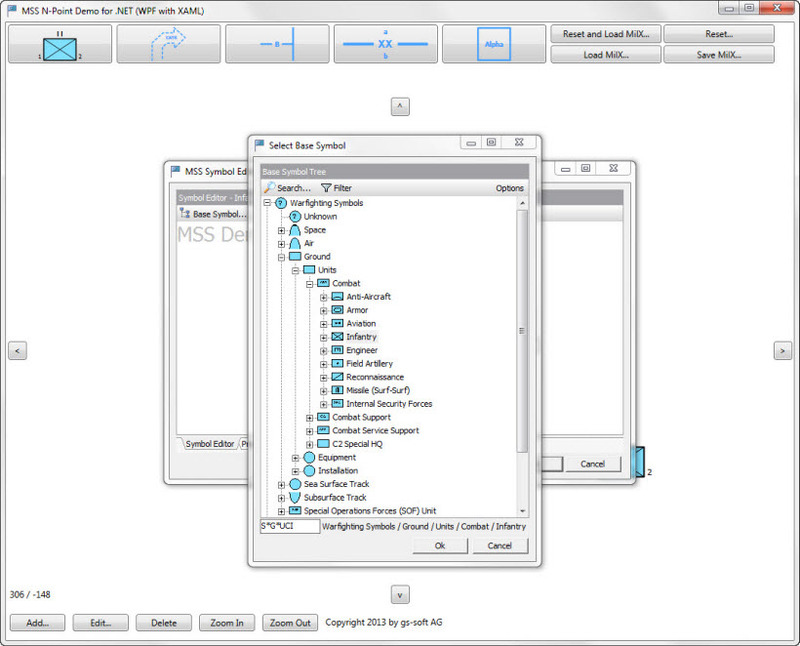 The galleries are designed to provide the most frequently used tactical graphics and symbols in a user-friendly way. Thanks to the improved SVG and XAML export, it is newly possible to export military map overlays from MssDraw directly to GoogleMap. 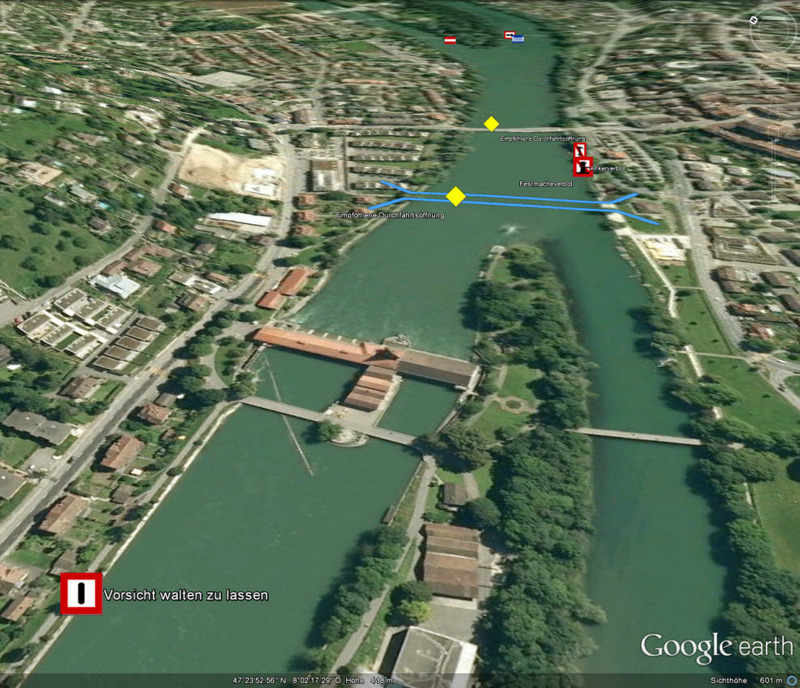 As already known from the GoogleEarth export individual or multiple layers can be selected and exported. The generated file resp. file structure can be opened afterwards in any web browser. This provides the export of layers on the following devices: IPhone, IPad, android phones and tablets as well as on Windows phones and tablets. 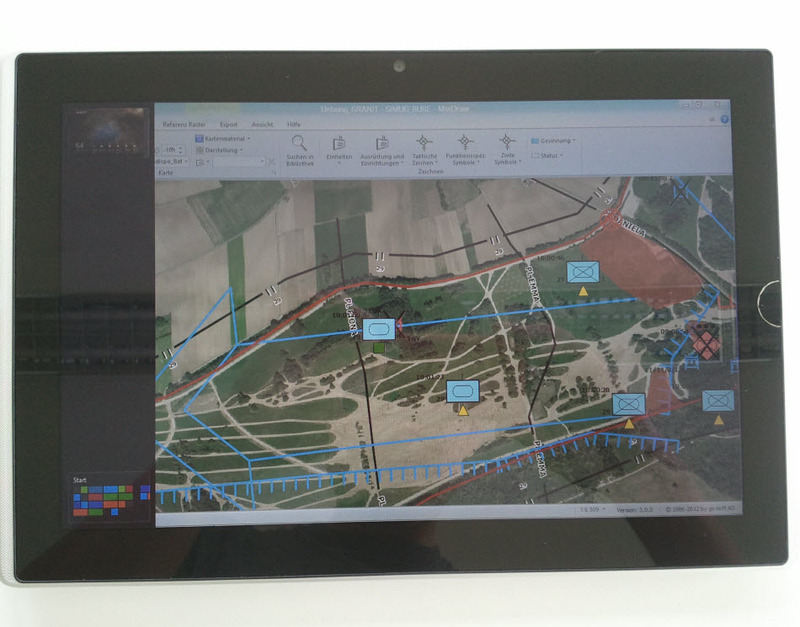 Hence the military map overlays created with the MssStick can be exported directly to a peripheral device which can be used platform independent. More information on this new feature will follow. In the last weeks, the XAML and SVG exports of symbols and tactical graphics out of MSS® (MSS Com Server) have been improved. 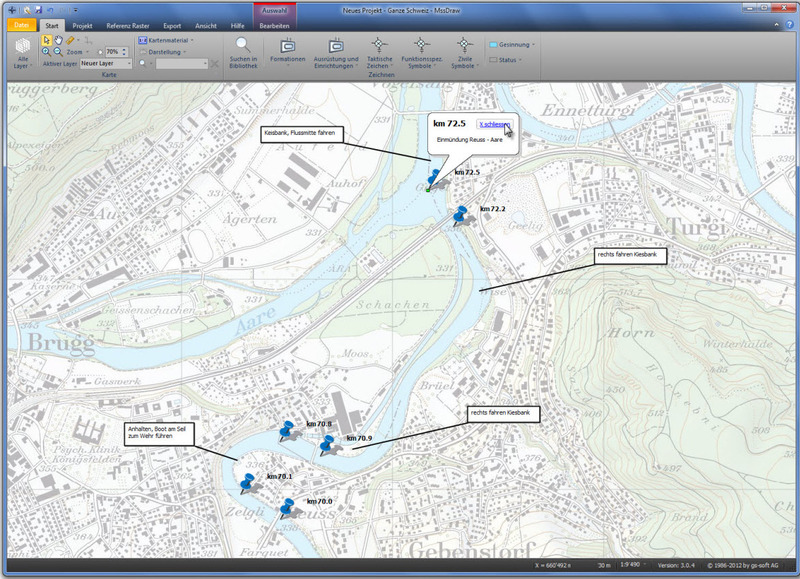 XAML is a possible way to embed the MSS Com Server (MSS Symbol Generator) in a GIS system as for example into ARC GIS. The internal developments enable an optimized generation of the corresponding 1-point symbols resp. n-point tactical graphics. 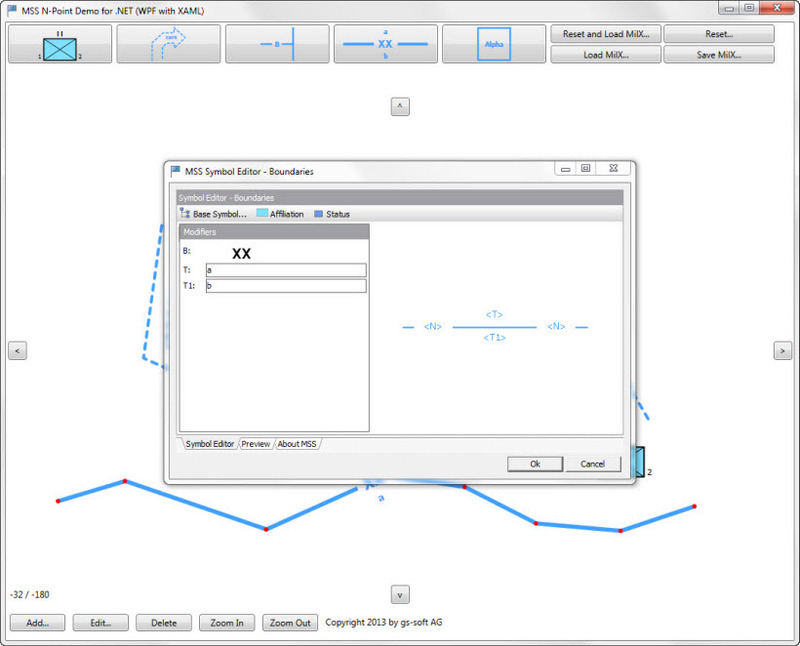 Further information about the enhanced SVG-export and its platform independent use is presented in a next article. 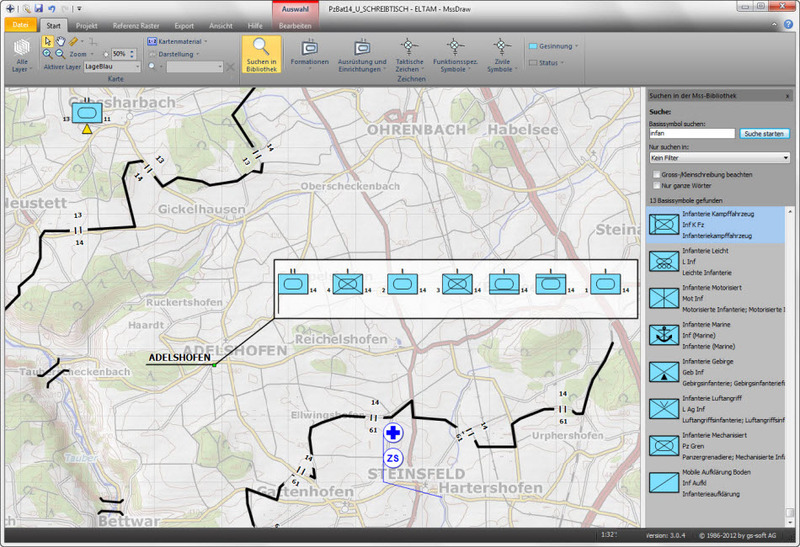 MssDraw and MssComposer ,the applications to create military map overlays as well as to manage organization-/operation-structures and state of readiness-/means-tables , have been improved step by step in the last months. The main goal was to enhance the applications speed by using less memory. The low consumption of memory lets the applications MSS, MssDraw and MssComposer run smoothly on the hardware used in the Army or installed on military vehicles. Furthermore the applications run also without any noticeable delays on subnotebooks of the first generation or on a windows 10 tablet with ATOM processor. The NATO Military Interoperability Program (MIP or short NATO - JC3IEDM) uses MIR GEN of gs-soft. This application bases on MSS® and thereby contains all symbols and tactical graphics defined in the international standards. The participants from the various nations use MIR GEN to link military symbols and tactical graphics from the standards MIL-STD-2525C, MIL-STD-2525B, APP-6A and APP-6B with the corresponding MIP-IDs . The final product of this work is amongst others the central data base which contains the single links between MIP ID and Symbol ID (more than 300’000 single links). Additionally, MIR GEN allows creating reports directly out of the maintained data. The international use of MSS shows the versatile applicability the product. You can find further information about the application MIR GEN in the documentation of the application. Some of the documents generated with MIR GEN can be downloaded from the NATO - JC3IEDM / MIP homepage. As of MssStick version 3.1.3 it will be possible to activate the "Tablet-Version" functionality in the options window of MssDraw. 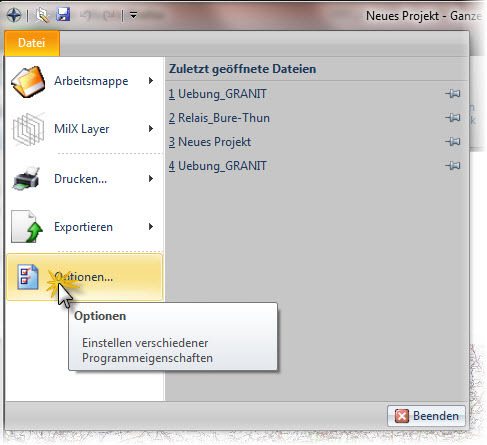 This function enables the touch-optimated use of the application. 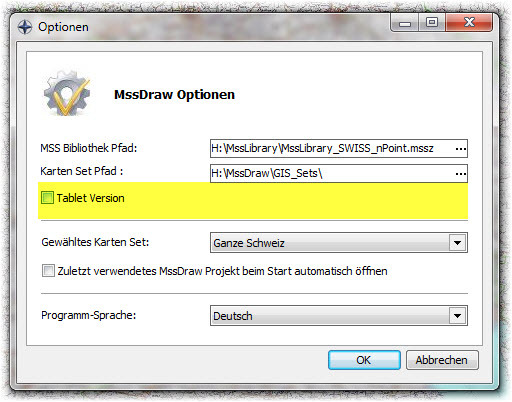 MssDraw can be executed then without any problems on one of the new Windows 8 Touch-Screen PC's or a Windows 8 Tablet. The maintenance of the maps with activated "Tablet-Version" will be processed via from further mobile devices already well known Gestures. 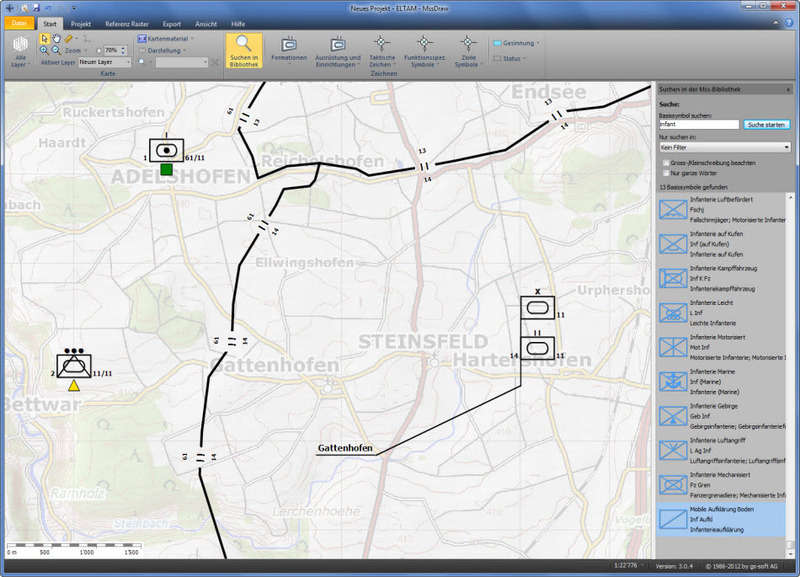 Additionally, we enhanced the editing and placing of symbols and tactical graphics on the map. Grouping of symbols: Symbols with the same reference point can be grouped in a box. Staff-symbols with the same reference point can be joint together with a general staff-bar (see print-screen on the right). Reference line with text-label: A text-label containing the name of the location can be added to the reference point of the reference line. 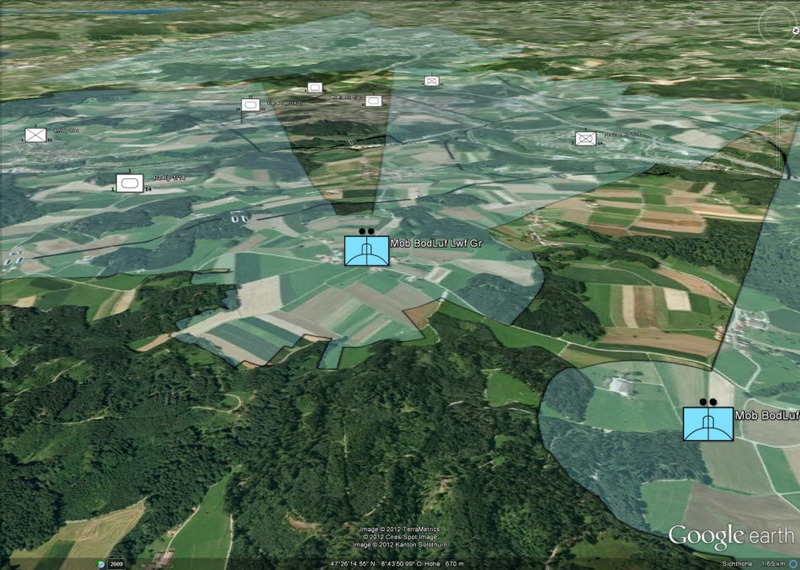 These two new features will help generating a easy to understand military map overlay. In the past two weeks, we have set the focus on the integration of maritime symbols. 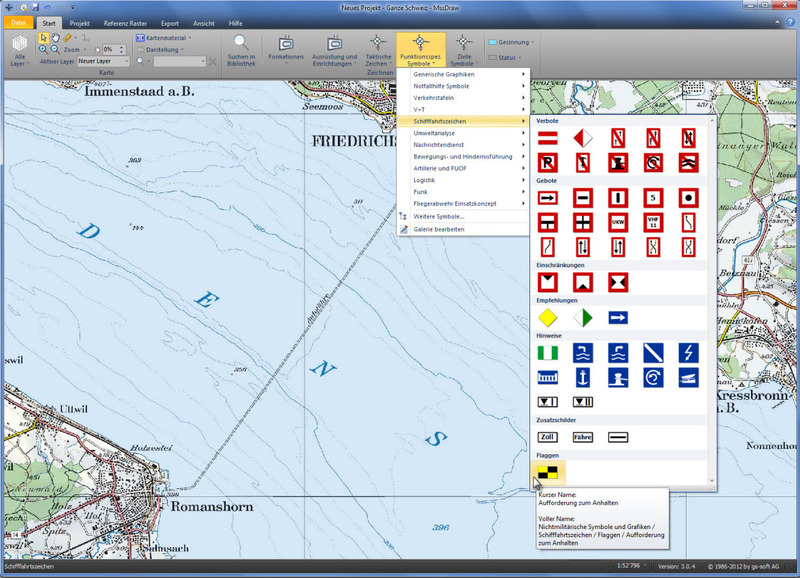 Integration of regulations 57.004: Naval navigation symbols defined in the Swiss Armed Forces regulation 57.004 have been added to the MSS Library. This enables the planning of military work on and in the water as well as the creation of an operation picture for the movement of military units on the water. 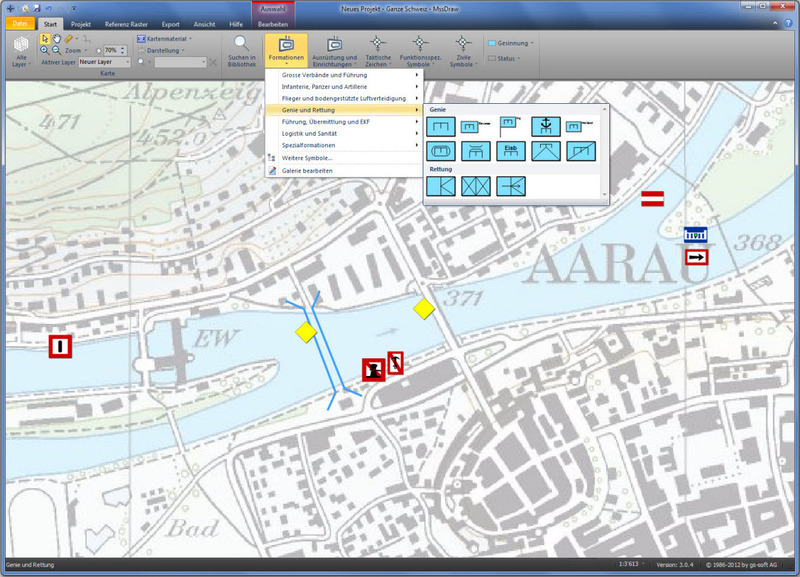 Integration of the European inland water navigation signs: In addition the most commonly used signs in the European inland water navigation have been added into the MSS Library. This will allow the creation of a joined common operation picture between civil units (police, firefighter, …) and the armed forces. 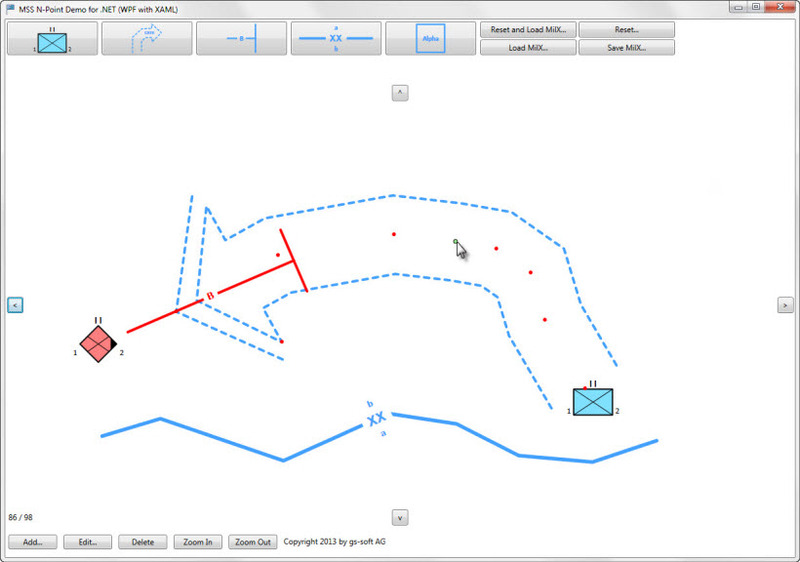 MssDraw is the first application that offers an easy way to represent a joint operation picture in the Swiss Armed Forces. 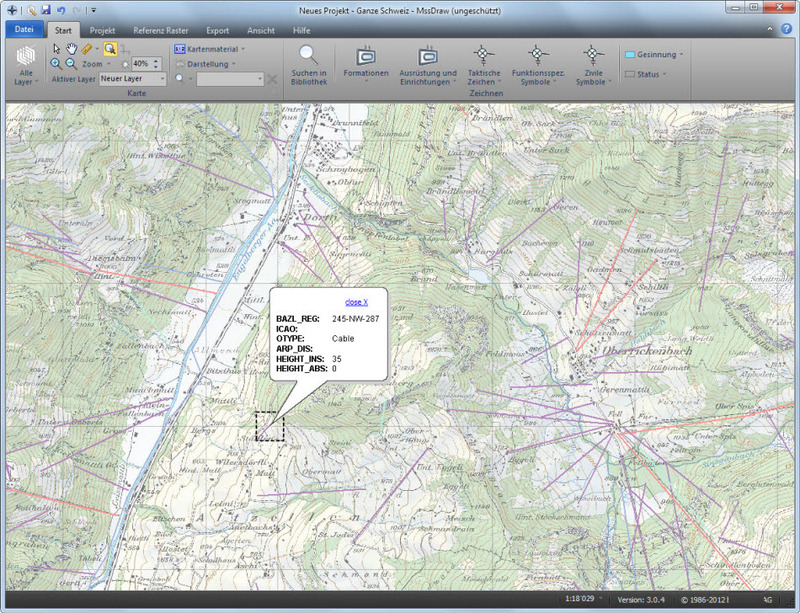 The application enables the combination of the various military map layers from the different source systems as well as from the different staffs (combination of operational picture of air- and land forces). 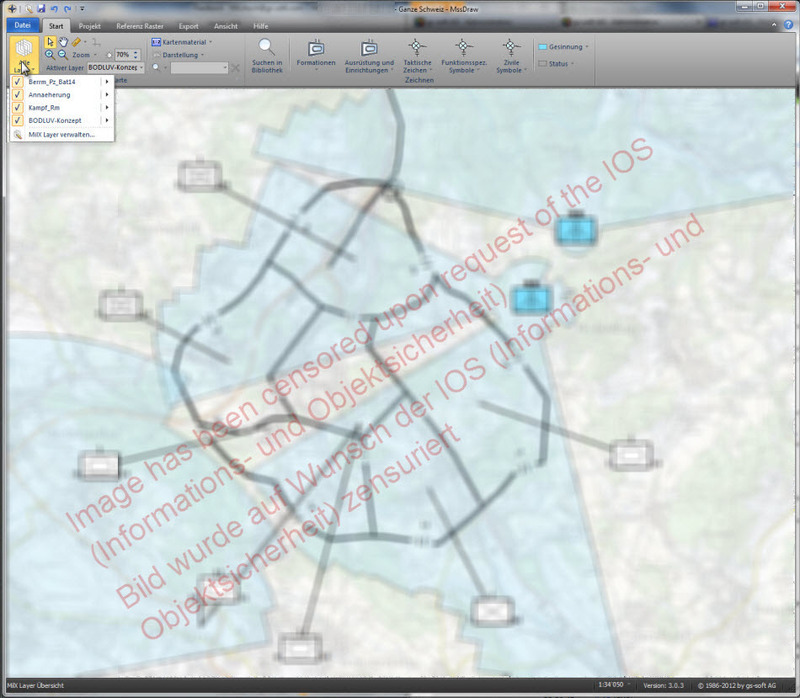 As a prove of concept for the use of the MssStick in the air force we’ve integrated the obstacle map (GIS-Set of power lines, cable cars, lifts,...) into MssDraw. This could be done easily using just a few clicks.